SHOW COUNTDOWN: Epson's EH-DM2 projector system to ship with free digital photo frame | What Hi-Fi? It's not the first product of this type that we've seen but when you add in the fact that Epson is giving away a free AGFAPHOTO digital photo frame in to the bargain, it may be the most function-heavy example. Epson will be at the What Hi-Fi? Sound and Vision Show at ExCeL London this weekend, so you'll be able to see the EH-DM2 for yourself. Not got your ticket? Head over to the website here for all the details. 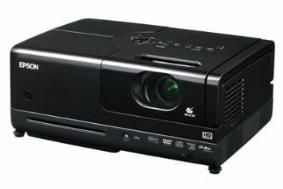 The projector is 'HD compatible' with a DivX-compatible DVD player, claims a 1200 ANSI lumens and has inputs for PC, USB and MP3 player connections. The AF 5070 M multimedia frame has a 4-in-1 memory card reader and a 7in LCD panel – and hey, while stocks last it's free! Find out more about this deal, and the rest of Epson's home cinema range, at the What Hi-Fi? Sound and Vision Show, which runs from Friday 31st October to Sunday 2nd November at ExCeL London.